Hydraulic fracturing has been around for decades. But now, natural gas producers are deploying a new gas drilling method called high-volume horizontal hydraulic fracturing to release gas locked in untapped shale formations. According to a report by the Department of Energy's outside advisory panel on natural gas, in 2011, shale gas reached 29 percent of total dry gas production in the lower 48 states, up from 6 percent in 2006. Drilling is moving out of remote areas to within range of millions of people in cities and towns – and their water supplies. Injecting the earth with as much as 8 million gallons of water laced with sand and toxic chemicals, aiming to release gas trapped in bubbles within shale layers. The U.S. Environmental Protection Agency estimates that by 2020, shale gas will comprise more than a fifth of total U.S. natural gas production. Give gas a free pass? Requires noisy, polluting roads, trucks, fuel and construction materials. 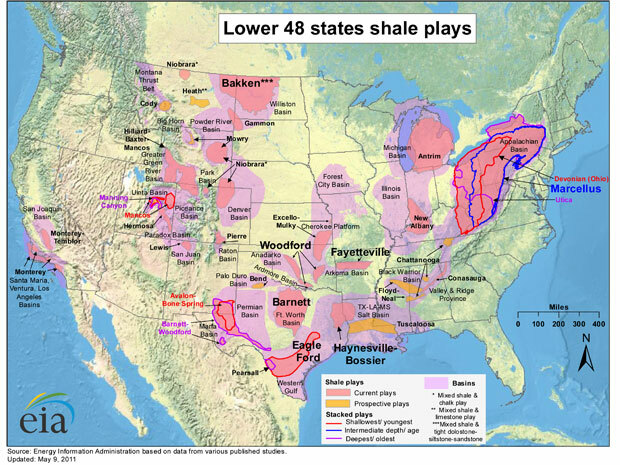 Gas producers are moving aggressively to launch gas drilling operations throughout the eastern U.S., along a 350 million-year-old formation called the Marcellus Shale that extends from southern New York to Pennsylvania, western Maryland, West Virginia and eastern Ohio. Drillers claim fracking does not pollute ground water and underground water supplies, called aquifers. But growing numbers of Americans, many in rural communities, report that wells and other water sources have become unusable since fracking operations started up nearby. Environmental Working Group has documented illegal practices, the use of toxic chemicals and water contamination that is apparently linked to fracking. Unless high volume fracking and drilling is barred near drinking water sources and carefully regulated elsewhere, gas production will pose an expanding threat to homes, property values and water supplies. It's critical that policymakers and environmental watchdogs close federal exemptions and intensify federal and state scrutiny to avert serious environmental damage as the pace of fracking accelerates. Companies inject into each well up to 8 million gallons of water, chemicals and sand at high pressure to create underground fractures that free up trapped natural gas. Commonly used chemicals include: carcinogenic benzene, toluene, ethylbenzene, xylene and other toxics. In December 2007, a Bainbridge, Ohio, home exploded (http://www.dnr.state.oh.us/Portals/11/bainbridge/report.pdf) after a natural gas company improperly drilled and fractured a nearby well. No one was injured, but releases of gas contaminated 23 water wells and forced evacuations of 19 homes. 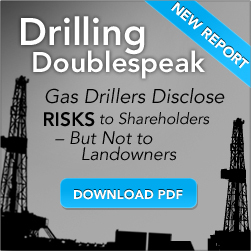 Fracking a single well produces up to several million gallons of wastewater. In 2008, Pennsylvania authorities took remedial measures after determining that a water pollution control plant had accepted drilling wastewater that contaminated the Monongahela River. Gas drilling in shale deposits requires heavy use of chemicals. Spills happen. Pennsylvania authorities fined Cabot Oil & Gas $56,650 (http://pqasb.pqarchiver.com/pressconnects/access/1885613591.html?FMT=ABS&date=Oct+23%2C+2009) for three spills of hydraulic fracturing fluid near the town of Dimock in September 2009. Two of the spills polluted a wetland and caused a fish kill. Drilling can require 1,300 truck trips per well (http://www.dec.ny.gov/energy/58440.html), often in areas where roads do not exist or are not built to handle heavy trucks. Trucks cause significant air and noise pollution and can spill their loads, endangering water supplies.